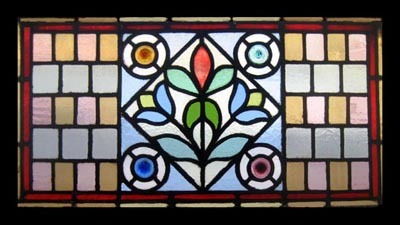 This Magnificent Window has THE MOST BEAUTIFUL FLOWERS SURROUNDED BY 4 BEAUTIFUL RONDELS. BEAUTIFUL BOLD COLOURS ENHANCED BY BEAUTIFUL RONDELS. It originated from A property in MANCHESTER. Intricate pattern on this window, VERY UNUSUAL. This is a rather special antique to grace any home or gallery. And could make a fantastic design feature for any property. The window is REHOUSED IN A NEW PINE FRAME frame measures 32 1/2"W x 19"H Glass 29 1/2 X 16 br> You can buy this now using the paypal link below the photograph or e-mail sales click here to arrange payment by personal check ,money order or bank transfer.